Girl Scout cookies S’mores, Thin Mints, Peanut Butter Patties, Peanut Butter Sandwich, Shortbread, Caramel deLites, Lemonades and Thanks-A-Lot, as well as the new Caramel Chocolate Chip (on plate), are shown. FORT WAYNE, Ind. (WANE) - It's Girl Scout cookie time! The annual cookie sale in the Girl Scouts of Northern Indiana-Michiana council begins Friday. 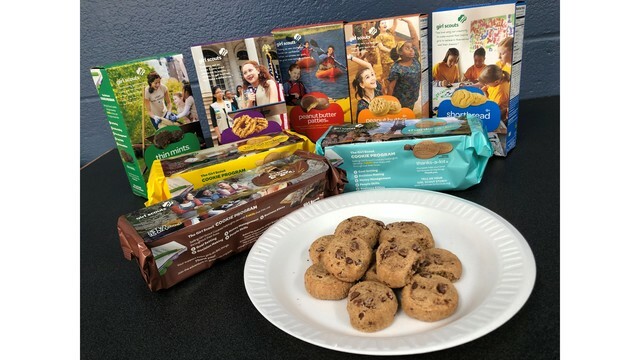 This year, nine varieties of cookies will be available for purchase from local girl scouts, including the new gluten-free Caramel Chocolate Chip. Also available will be: S’mores, Thin Mints, Peanut Butter Patties, Peanut Butter Sandwich, Shortbread, Caramel deLites, Lemonades and Thanks-A-Lot. Most Girl Scout cookies will cost $4 per box, with the exception of the new Caramel Chocolate Chip, which will run $5 per box. The Girl Scout cookie sale runs through March 3.